Please use this form to request DEM assistance for your exercise. We will contact you after receiving your request to let you know what assistance we can provide. 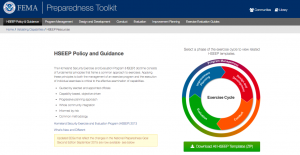 The Homeland Security Exercise Evaluation Program (HSEEP) Preparedness Toolkit is a website with all of the available templates related to the HSEEP policy & guidance. DEM has adopted HSEEP as a best practice for exercise design and development, conduct, evaluation and improvement planning. A graphic representation of the HSEEP Exercise Cycle includes over 18 elements to include in an exercise process (pdf graphic). HSEEP is part of the National Preparedness System (pdf graphic). There are seven exercise types. Four are discussion based and three are operations based. These exercises increase in their complexity. Here are a few exercise tools that may be used as aids for determining which exercise type is appropriate. Outdated – Target Capabilities List (2007) – Target Capabilities are based on the old Core Capabilities from the 2007 HSEEP Guidance. Although these are outdated, there are some valuable “tasks” that you can consider in your exercise design and evaluation planning processes. EMPG Sub-recipients are required to provide exercise reports utilizing the content found in the HSEEP templates for the exercises that they report. DEM recommends the use of HSEEP for all exercises conducted at the local, county tribal and state level even if they will not be utilized for grant reporting. 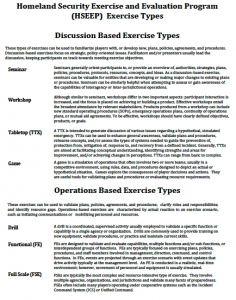 The table below includes links to the DEM exercise templates. NOTICE: This calendar is not designed for someone to register to attend or participate in an exercise (unless the listing says otherwise). The page’s purpose is to inform emergency managers of upcoming exercises statewide, enabling them to contact the POC to obtain additional information or permission to observe the exercise. Please contact krepp@utah.gov if you have an exercise you would like listed on this page.